Polynesian tattoos are equally fascinating and controversial, in the sense that they raise many questions. Can anyone get them? Is it disrespectful? CAN A NON-POLYNESIAN GET A POLYNESIAN TATTOO? Polynesian tattoos basically use two kind of symbols and patterns: some of them are considered tapu, which means "sacred", while others are considered noa, or "common, not sacred". Tapu elements should only be used by people who are entitled to them by family and descent, after proper ceremonies are held, while everyone else should only use noa elements for their tattoos. All of the elements presented in our books are noa, which means that you can use them all without fear of including symbols that you are not allowed to wear. DO POLYNESIAN PEOPLE CONSIDER DISRESPECTFUL IF OTHERS GET A POLYNESIAN TATTOO? It depends on how you approach Polynesian art and, ultimately, culture. Plain copying someone else's tattoo is always disrespectful, because you are stealing their own story. This values for Polynesian tattoos as well as for any other. Creating a Polynesian tattoo that tells your own story and being able to say what it represents, shows that you acknowledge and respect the importance of such tattoo and therefore it is not seen as disrespectful. It shows your appreciation and admiration for Polynesian art and culture. Remember: a Polynesian tattoo is never just a nice design! WHAT POLYNESIAN TATTOO SHOULD I GET? The only possible answer to this question is: one that represents you. This means that you should get a tattoo that is designed on your own story, that has value for you in relation to your life. As trivial as this may sound, this is always a good suggestion, no matter what: personal tastes could change over the years, and you may get tired of the nice design that you get today. BUT, if your tattoo has a deep meaning for you, if it tells your story, it will forever be meaningful and you will never regret it. CAN I WRITE NAMES OR LETTERS IN A POLYNESIAN TATTOO? YES, just remember that it is not traditional: Polynesian people used no alphabet as we know it prior to contact with European navigators. All knowledge was passed on orally or through the symbolism of Polynesian designs. So, how can you get a name into a Polynesian tattoo without it looking out of place? We developed a way to recreate an alphabet that blends nicely into Polynesian designs and we called it MAORIGRAMS as it is based on two Maori symbols to shape all the letters. Of course, like with any other style, we recommend never to get names tattooed unless they belong to your children. CAN I ADD NON-POLYNESIAN ELEMENTS INTO A POLYNESIAN TATTOO? Why not, if this relates to your story? Polynesian tattoos blend together visual appeal and storytelling, so you may decide to include any element that relates to your story and resonates with you. Every society is slowly but constantly shifting toward multiculturalism as it's natural, so why shouldn't tattoos reflect this? Do you have Irish origins? Why not adding Celtic elements to your tattoo? It is ok to add elements that relate to your origins and personal heritage as this is a strong feature of Polynesian tattoos. SHOULD I GET IT TRADITIONALLY HAND POKED OR MACHINE INKED? You choose. If you are not of Polynesian descent, both options are equally valid. IF you ARE of Polynesian descent, on the other hand, you may consider getting it traditionally hand poked for the connection it creates with your ancestors: the process you go through, the sounds you hear, are exactly the same process, the same sounds, that your ancestors experienced during their life. It's like bringing the past and them back to life, and both the preparation and the actual process can be mind-changing and empowering. WHY ARE THERE SO MANY DIFFERENT POLYNESIAN TATTOOS? Because Polynesian tattoo is just a general term used to identify tattooing traditions spread all over the Pacific Ocean which can be traced back to a common origin. All these traditions share the same techniques for example, and many symbols are common to most of them too, but the different geographical characteristics of the hundreds of archipelagos that compose Polynesia, which were populated over a 2000 years span, had a great impact on the style of the tattoos. While many styles are still present but not very known, the main five are Samoan (which has much in common with Fiji and Tonga), Marquesan, Tahitian (or modern Polynesian), Hawaiian and Maori. We can safely say that the environment was the primary reason for the differentiation of the art and for the birth of the different styles that exist today. 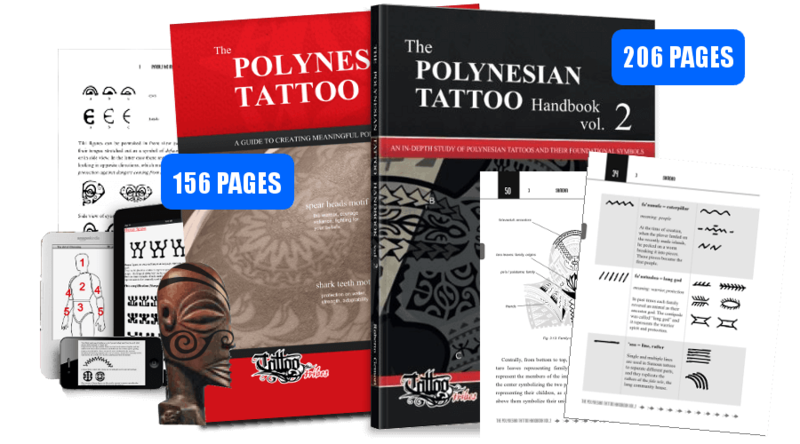 Hopefully, this rundown of the most frequent questions we were asked about Polynesian tattoos will help you get more aware of what they represent, possibly answering some of your own doubts as well. WANT TO SEE MORE BUT HAVE NO TIME TO KEEP CHECKING? Subscribe and we'll tell you when a new article is available!